Hello friends, At present time most of the mobile manufacturer companies launch budgeted smartphone which comes with different great features and latest technology. Today we have to discuss about an important topic Windows 8 and Lumia style for the Micromax and other Android Smartphone. 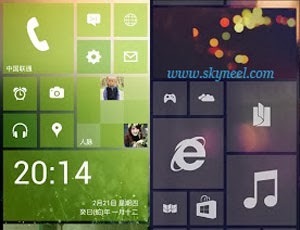 Launcher windows 8 is a good launcher for your android smartphone. With the help of this Launcher, you can feel windows user interface on with new style UI (User Interface) on your Android mobile phone. It has Windows Phone 8 layout and design for your phone. Windows 8 Launcher has a new style UI for your Android Device. It has Windows Phone 8 layout and design for you to get experience like Windows Phone on your Android phone.Windows 8 Launcher is requires Android 2.2 and an upper version of Android. It is easy to install and available at Google play store for free. So you must install this great launcher on your smartphone. In this Launcher you can use tiles in different sizes and color. Windows 8 launcher allow you to save theme and restore this theme any time. It provide edit background style and also screen layout. I hope you like this Windows 8 launcher and Lumia style from which you will be able to easily install Launcher windows 8 and you can feel windows user interface on with new style UI without any extra efforts. If feel any problem in this guide then please use comment box. Thanks to all.